AND RECEIVE A FREE mp3 TODAY! "The Girl With Faraway Eyes" - yours for free! 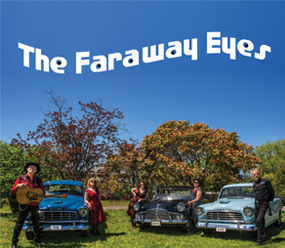 Find out where else The Faraway Eyes played last time and learn where they are playing next time. The Faraway Eyes Facebook Page covers all their musical pursuits: Buck & Deanne & The Amazing 3. Suitable for new and traditional media publication, newspapers, programs, posters. The Faraway Eyes Biography, Tech Spec Sheet, Stage Plot, generic gig poster.